It’s hard to find peace and quiet in the modern world. It’s important to let your brain take a break from the noise pollution, but it’s easier said than done with all the cars, lawn mowers, radios and TVs around us. The main cause of daily stress for me personally is my smartphone. It wakes me up, then beeps every few minutes with reminders, Facebook notifications, emails, text messages, Whatsapp messages, calls from my mom and girlfriend every other hour and just wait until the battery hits 10% and your phone starts screaming for charging. Turn off all unnecessary notifications and alarms and if you really need some peaceful time, turning your phone off would be one of the best things you could do. Yes, you could miss some important social media events and some photos of your best friend’s cat, but it will most probably be worth it. Meditation is a great idea in this busy age. Even 10 minutes a day could improve your life significantly. You’re too busy? Make them 30 minutes! When you meditate you learn to shut not only your brain, but also surrounding sounds. Start small (let’s say 5 min) and progressively build up. If you live near a lake, sea or the ocean, you are really blessed! Find a boat rental if you don’t have one and sail away from the shore to find some peace and quiet away from people and change the typical urban noises with peaceful and soothing sounds of waves and breeze. 4. Or just hit the woods. Hopefully around the place you live there would be a mountain, woods or just a national park. Go there and follow some tiny path away from civilization. Don’t get lost though! Take some food with you, a nice book maybe and enjoy the calming sounds of the wild. Although I like listening to music or audio books while driving, sometimes I just need some peace and quiet. Sometimes when I need a rest of the noisy urban environment I just get in my car at night and just drive on a peaceful little road out of town. It’s even better if the weather allows it to open the windows and enjoy the sound of wind. This is not the quietest thing you could do, but it is still better than listening to honking cars, TVs and yelling people in the city. And when you listen to music, play something you really enjoy, not the blathering of the radio DJ. Find a real page-turner, something that will teleport you far away from your reality. A good book can take you to an alternative dimension in which noise hasn’t been invented yet. Vast readers probably know that feeling. 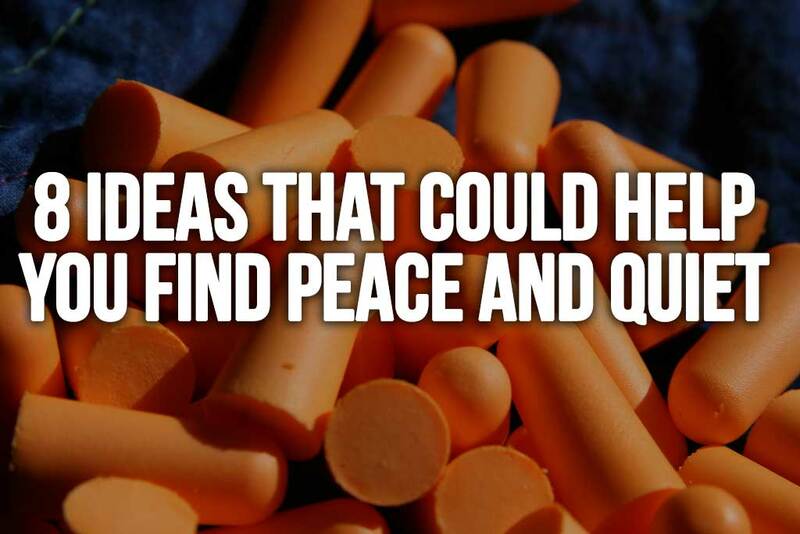 Sometimes finding peace and quiet is mission impossible, but with a pair of good earplugs you could turn every place into a quiet place. Invest in a good pair of noise-canceling headphones or just high-quality foam wonders to keep on hand. Take them out of your pocket and stick them in your years whenever you need to set the world to mute. 8. Keep your TV and radio off. Many of us turn on our TV’s just because we’re used to doing it. Dare yourself to keep the TV off and sit in silence for a while.